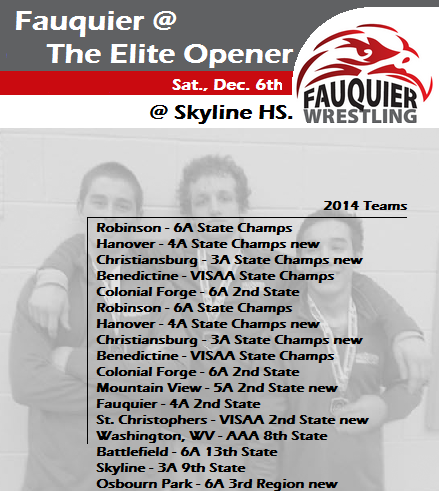 As the 2014-15 season kicks off for the Fauquier Falcons they find the Elite Opener a measuring stick alongside the other top teams in the state. Currently Fauquier is ranked third in the state by the VAWA as team Fauquier earns third place with 325 points in this season opener event. Placing third as a team last season once again team Fauquier proves to show that they have the depth to maintain champions. 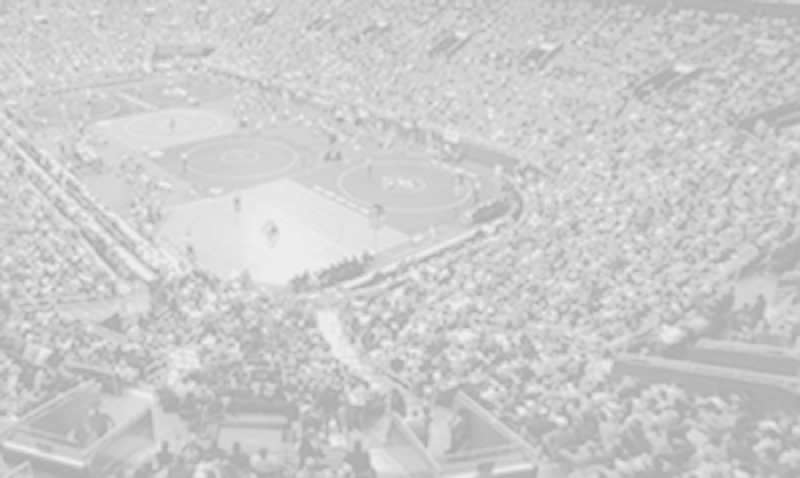 With twelve schools attending this tournament it groups wrestlers into three pools of four and after competing through the first three rounds wrestlers are then re-grouped into four different championship pools based on similar records. Team Fauquier qualified three wrestlers into the Championship Final pool and seven other wrestlers into the 4th placement pools. For team Fauquier to earn a third place finish at the Elite Opener most certainly called for advancing wrestlers into the championship final pools and winning - as that what happened. But having seven Falcon wrestlers to take steak on winning at least two matches during the opening first three rounds could serve as the underline reason why team Fauquier finished in the top three at day’s end. Daniel Ariola, Matt Raines, and Garrett Tingen were the three Falcon wrestlers that earned a bid to the Championship Final pools and as one looked back to last season it was these same three wrestlers that made the Elite finals then. 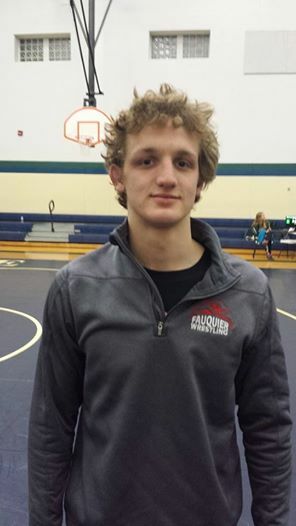 As senior Daniel fell short in his two final matches to earn a 3rd place finish, Matt Raines showed complete control in his dominates on the mat by winning a 3-0 win over Trevor Watkins of Mountain View and a 5-1 win over David Giantonio from Christiansburg. But the most exciting finals came on the heels of Matt Raines final match as Garrett Tingen and the 16th Nationally Ranked Corbin Allen from Hanover would battle for the 160lb Elite title. Both Garrett and Corbin earning a win over Taylor Rudnick St. Christopher`s which set the stage for two 4A State Champions from last season going head-to-head for the Elite Crown. Right from the start both Garrett and Corbin exchanged shots as the score midway through the 1st period was 2-1 in favor of Allen – a take down by Allen and an escape from Tingen. Then and within the last 20 seconds of the 1st period controlling the front headlock Tingen rolled a low level upper body move which he was able to score a takedown on Allen straight to his back in a five point move - almost recording a pin during this flurry. But as the first period ended Corbin was able to get off his back and fight for an escape. The 1st period ended with the score of 6-3 as Tingen holding the lead. As the second period started Tingen was on bottom as Allen was able to earn a near fall pushing the score to 6-5 still in favor of Tingen. The match would then go into the 3rd period as Tingen was on top. Working a cross face cradle pinning combination hold on Allen, Tingen sealed the match with a pin as the Skyline gym erupted with excitement. 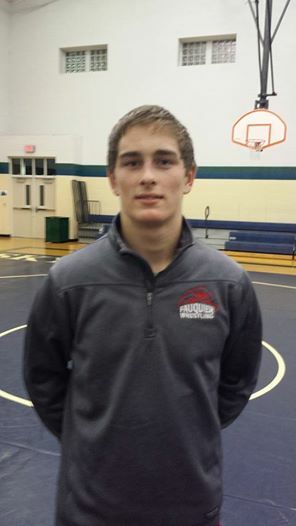 Both Matt Raines and Garrett Tingen start the season going 5-0. Other notable results from the Elite Opener came from 106lbs Joe DelGallo and 195lbs Andrew Smith who both went 4-1 and took a fourth place finish. Q: Currently ranked 3rd in the state how did your team measure-up with the other teams at this event? Q: Garrett Tingen earned four pins and had a crazy final match with Corbin Allen to win the Elite Opener any reflection on this match? Q: Are their areas of Improvements for team Fauquier? 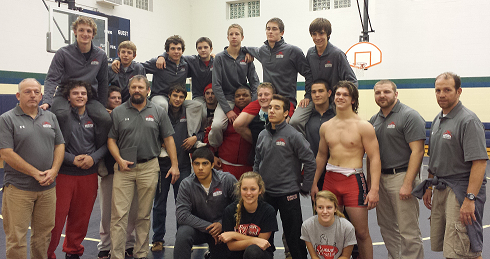 Next Meet: The Falcons will host the Falcon Duals next week on Saturday, Dec. 13. Below are the team individual results from the Elite Opener. Round Notes: Fauquier went 9-5 with 1 bye. and 6 pins. Round Notes: Fauquier went 6-5 with 4 bye. and 3 pins. Round Notes: Fauquier went 4-8 with 3 bye. and 2 pins.